The residential application has accounted for the largest share in the overall refrigerator market. In the coming years, the demand for energy efficient refrigerator is exhibited to increase owing to rising electricity consumption. The report thoroughly covers refrigerator market by types, capacities, applications and regions. The report provides the unbiased and detailed analysis of the on-going trends, opportunities/high growth areas, market drivers, which would help the stakeholders to decide and align their market strategies according to the current and future market dynamics. •	Historical & Forecast data of Saudi Arabia Consumer Durable Market Revenues for the Period 2010-2022F. •	Historical & Forecast data of Saudi Arabia Refrigerator Market Revenues & Volume for the Period 2010-2022F. •	Historical & Forecast data of Saudi Arabia Refrigerator Market Revenues, By Capacity for the period 2010-2022F. •	Historical & Forecast data of Saudi Arabia Refrigerator Application Market Revenue for the Period 2010- 2022F. •	Historical & Forecast data of Saudi Arabia Refrigerator Regional Market Revenue for the Period 2010- 2022F. •	Saudi Arabia Refrigerator Market Dynamics. •	Saudi Arabia Refrigerator Market Trends. 16.2.1	LG Electronics Saudi Arabia Ltd.
16.2.2	Samsung Gulf Electronics Company Ltd.
16.2.3	Hitachi Saudi Arabia Ltd.
16.2.8	Hisense International Co. Ltd.
16.2.9	TCL Household Appliances Co. Ltd.
Saudi Arabia refrigerator market is forecast to grow at a CAGR of 7.56% during 2016-22. The market for refrigerators is further growing on account of residential developments along with commercial establishments. Increasing number of households and increasing disposable income are two major factors driving the demand for refrigerator in Saudi Arabia. The government continues to exert efforts towards reducing energy consumption by imposing energy efficient norms, which has resulted into increased volume sales for refrigerators with five star ratings. 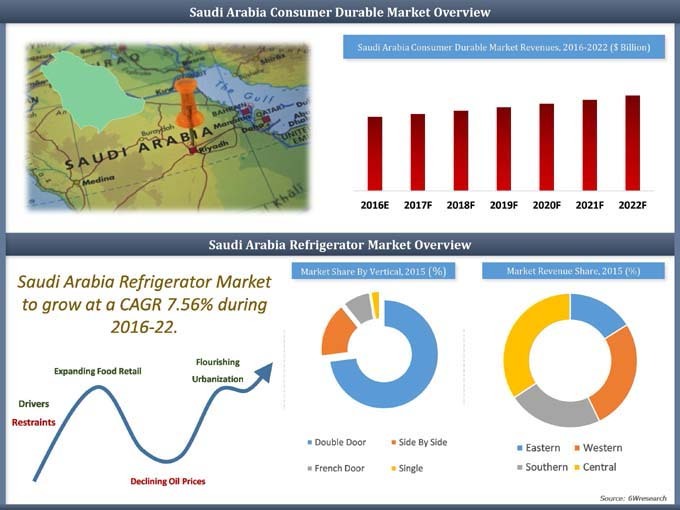 Saudi Arabia Refrigerator market report has been segmented into various types, capacity wise, applications and regions wise. The major companies in Saudi Arabia refrigerator market includes- LG, Samsung, Haier, and Hitachi.